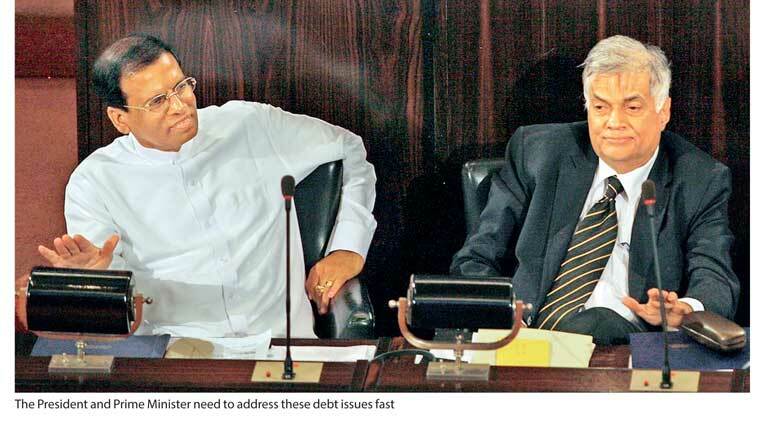 Home / Columnists/ Sri Lanka’s debt situation: Getting better or what? 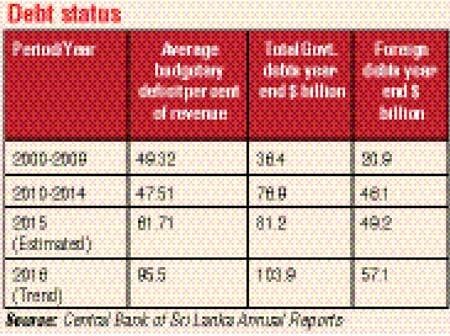 Sri Lanka’s debt situation: Getting better or what? The external financing situation for Sri Lanka is certainly a big worry for both the Government and the private sector. This is largely due to monstrous financial profligacy of the past not yet fully explained. However it is also due to a large trade deficit and a drop in exports and worker remittance. In 2015, our trade deficit was around $8.5 billion. Worker remittance was around $6.9 billion. Capital flows were negative. We had a balance of payment deficit of $1.5 billion. The only upside in 2015, was tourism – $ 3 billion – a 24% increase and $ 3.5 billion in 2016. If the trade deficit can be managed to around $7 billion, the higher income from tourism, exports and technology services could help our balance of payments to have a surplus. However, there are many other challenges for our external finances like the stability of the rupee, declining reserves and capital flows. Our export income is only around 55% of our imports. Therefore it is a must that Sri Lanka in the short term limits the foreign debt financing only for projects that have multiple benefits for the economy. Furthermore we need to focus more on debt refinancing, debt swaps, work hard to attract more FDI by introducing investment friendly policies and restructure the BOI to support that drive and more importantly manage the export trade supply side of the equation. To do all this we need people who understand the job to do the job. Sri Lanka’s total Government debt at the end of 2015 was $ 81 billion, out of this foreign debt was around 60%. According to Central Bank data our total debt is around $ 103 billion – around 98% of revenue and foreign debt around $ 57 billion. Today public debt is almost 100% of GDP. Therefore there is lot of work that needs to be done given that we have BOP deficit of $1.5 billion coming from 2015 to 2016 to manage first. Many of the short-term loans got at exorbitant rates taken for unproductive projects is one of the root causes for this situation. For example, the Mattala Airport and Hambantota Port loan arrangements needs to be renegotiated and those assets needs to be productively used for the betterment of society. The IMF Structural Adjustment Facility and the development bonds have helped the economy to ride over this crisis, however the policy direction to improve the supply side is a must as well as tightening of fiscal and monetary policies. The excessive increases in borrowing, specifically external debt, is because Sri Lanka’s domestic savings historically has been very low. For instance, on average, Sri Lankans save only about Rs. 17 out of Rs. 100 that they earn. Thus, to maintain a high investment of about 25% of GDP, we have to borrow money from outside. That is why Sri Lanka has relied heavily on foreign borrowings and those borrowings have increased. Furthermore Sri Lanka has had a deficit in the current account of its balance of payments continuously for a long time. To fill this gap, it had to borrow from external sources. The Government’s revenue has also been at a low level compared to its expenditure commitments. To fill the Government’s budget deficit, it had to borrow from both the domestic and foreign sources.Therefore as a country fiscal discipline is a must. While the Government is looking for short-term options to ride over this crisis like the currency swap with India for $ 1.1 billion and the proposed one with China for $ 1 billion and leasing of assets, all these arrangements have costs and political consequences. It is important from now on to only invest in ongoing projects if there are clear benefits over cost and projects that don’t drain our foreign exchange reserves. Some of the big-ticket projects like the Megapolis, mega road development projects may need to be phased out over the next few years. However the Central Bank pushing the rates up would cost the Government a huge amount of additional money. Furthermore rising rates would hurt the economy and overall growth in particular. The only answer would be improve confidence by having a competitive interest rate and an exchange rate mechanism to win the confidence back and get more investments. Government domestic debt has increased from Rs. 4,278 billion in 2015 to Rs. 5,332 billion and interest rate on a one-year T Bill has increased from 6.01 to 10.74 (2015-2017). Additional cost of borrowings for the Government would be around Rs. 315.35 billion. The impact of all this has resulted in increasing taxes. The Finance Ministry has also worked hard to improve revenue collection. A lot more however remains to be done. As a country we need to attract a minimum FDI of $ 1.5 billion annually, however if we are to attract more FDI we need to promote Sri Lanka as an investment destination, invest more on education and skills to improve the productivity of the workforce. In the short term we need to improve our inward remittances by up-skilling our workers, given that the dependency of inward remittance given our current USP may no longer be sustainable in the long term. FDI instead of debt financing and foreign borrowings is what we need: That however would require a conducive investment climate that protects equity-rights, and property rights and deregulation. With GSP+, Sri Lanka urgently needs a medium term plan to increase commercial exports and services. The Sri Lankan economy has faced much bigger challenges before. Therefore given its strategic location within South Asia and the enormous goodwill we have earned in the last 24 months with the international community, Sri Lanka should look to exploit those connections for the benefit of all Sri Lankans.